In March 2013, the Center for Religion and Public Affairs’ director, Melissa Rogers, was named as the Director of the Office of Faith-Based and Neighborhood Partnerships for the White House. With Rogers’s new appointment the Center is no longer operating. Since 2004, the Center promoted the research, study and dialogue regarding the intersection of religion and public affairs, and provided resources for policymakers, divinity school students and religious leaders on these issues. The “Joint Statement on Religious Expression in American Public Life,” produced by the Center, is still available. See below. This project began several years ago when the Freedom Forum’s First Amendment Center and the McCormick Tribune Freedom Museum hosted a discussion about the future of religious freedom. At the conference, participants discussed some ways in which earlier joint statements (see below) on church-state issues had helped to advance public understanding of the rules governing religious expression in public schools and in the federal workplace. Conference participants agreed that it would be useful to draft another joint statement of current law, this one addressing some issues related to religious expression in the wider public square. Melissa Rogers suggested that the participants pursue the project under the auspices of the Wake Forest University Divinity School’s Center for Religion and Public Affairs. The drafters’ purpose in crafting this statement is to help foster an accurate understanding of current law and improve our national dialogue on these issues. While there is disagreement among the drafters about the merits of some of the court decisions and laws mentioned in the document, the drafters agree that current law protects the rights of people to express their religious convictions and practice their faiths on government property and in public life as described in the statement. In other words, while this diverse group often disagrees about how the law should address issues regarding the intersection of religion and government, it agrees in many cases on what the law is today. More broadly, the drafters also agree that religious liberty, or freedom of conscience, is a fundamental, inalienable right for all people, religious and nonreligious, and that there is a need to correct misunderstandings about this right. The joint statement, which is formatted in a Q and A style, seeks to provide accessible and useful information for Americans about this area of law. 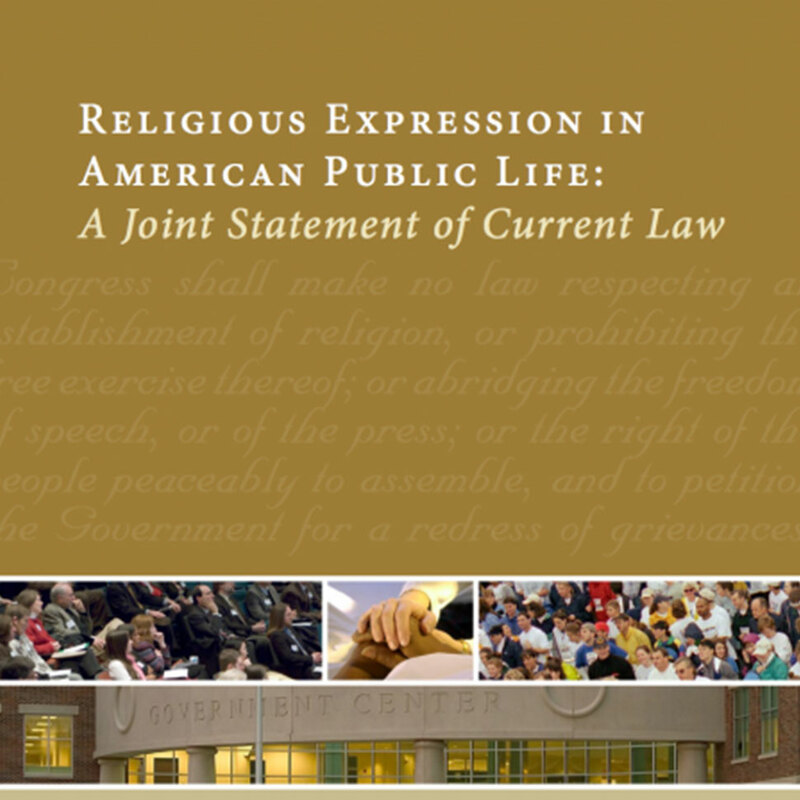 The full text of Religious Expression in American Public Life: A Joint Statement of Current Law is available by clicking the image to the left. It is also available for digital download — including iPad and PDF versions – free of charge through HP’s MagCloud. In addition, bound and full-color print copies are available for sale. For details about previewing, downloading, printing, and shipping, click here.